Ever wonder where "assignment of benefits" abuse came from? Let me introduce you to Harvey V. Cohen of Orlando and Maitland and any place else where tragedy has befallen Florida homeowners. Cohen is the self-professed "go-to attorney for assignment of benefits contract cases ... known throughout the state of Florida and nationwide," reads his bio. Which I don't doubt for one minute. In 2006 there were only 405 AOB lawsuits across all of Florida's 67 counties. Then Cohen figured out how to cash in on hurricanes. AOB started out as a document to protect consumers beset by property damage from slow-paying insurers. It allowed a third party, such as a water extraction company, a roofer or a plumber, to "stand in the insured's shoes," get on with fixing the damage and seek direct payment from the insurance company. 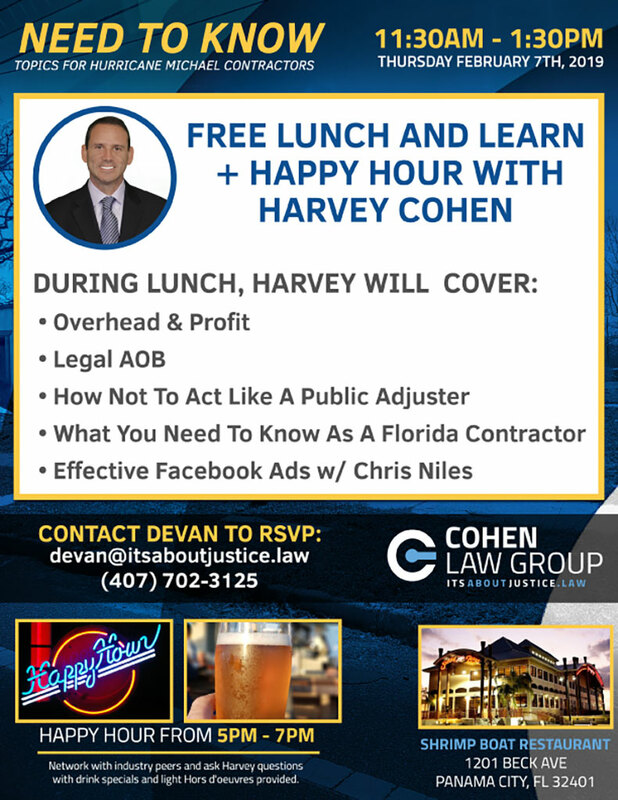 Little did state lawmakers realize Cohen would turn AOB into a cottage industry for himself and a few other unscrupulous lawyers and contractors -- many of the contractors unlicensed -- to generate legal fees, drive insurance companies out of the state and inflate property-insurance claims, often making unwitting Floridians victims of fraud. By 2018 AOB lawsuits had become such a lucrative but somehow legal scam that tens of thousands of AOB lawsuits had piled up, forcing at least five property insurers to leave South Florida. Former Florida Supreme Court Justice Ken Bell, testifying on behalf of the Personal Insurance Federation of Florida, Inc. (PIFF), told the Senate Banking and Insurance Committee last Monday there was "no crisis of bad faith" involving insurers to justify all of the lawsuits. "Yet, AOBs are so out of hand that in the 12 months of 2018, just one Florida attorney was responsible for filing 30,000 AOB lawsuits -- that's 125 lawsuits a day." Most observers speculate that it was the calm after the storm that turned Cohen into the Johnny Appleseed of AOB abuse. What he did, they say, is take advantage of the glut of roofing contractors, water remediators, plumbers and similar contractors who set up shop immediately after Florida's worst hurricane year, 2004. Then, when the big storms stopped coming, they had to find another way to prosper. Many did so honestly. But trial-lawyer Cohen launched a very attractive mentoring campaign -- advertising for contractors and vendors -- in effect recruiting them -- even putting out flyers and conducting seminars. And it was like dropping a match on a bed of pine needles. Cohen, on his office website, tells us exactly how he gave birth to his business. "In 2004 and 2005 during the many hurricanes we had here in Florida ... Mr. Cohen met with some restoration companies and thought of a way to teach assignment of benefits so that they could get paid directly from insurance companies, just like medical doctors and PIP suits. Mr. Cohen has literally handled thousands of insurance claims." Cohen doesn't file many lawsuits himself. He leaves that to his staff of associates. Who, according to court records, are exceedingly busy. One of them, Isabel M. Arias, for instance, filed 3,380 mostly AOB lawsuits just in the Miami area during 2018, 2017 and a handful during 2016. According to one of Cohen's ads for the event: "You should attend if you're in the following industries -- Restoration, Mold Remediation, General Contracting, Plumbing, (and) Roofing." It's as if Cohen franchises. Explains his bio, "Mr. Cohen teaches courses that provide continuing education credits approved through the IICRC. The IICRC certifies restoration companies for trade specific talents. IICRC courses help restoration professionals keep up with the latest techniques, technology and education for the restoration industry. Mr. Cohen’s IICRC-approved course, 'Insider Secrets Assignment of Benefit', is very informative due to its content regarding insurance claims and contracts." I was unable to reach Cohen on Wednesday. The bottom line is, this is what Johnny Appleseed does, teaches to amass contractors who throw business his way. It's how he grows his business. Doug Broxson, R-Gulf Breeze, chairman of the Senate Banking and Insurance Committee, vowed in an impassioned statement during the Jan. 22 meeting of his committee to make this the year assignment of benefits abuse in Florida gets fixed. Cohen looks to be expanding rapidly. Let's hope Sen. Broxson can pull it off. Simple solution to all the problems: Reform, Regulate, & Round Up those who fail to abide! AOB initially served a purpose, but its nothing more than an scam now. Generally the homeowner doesn't even know they are suing the carrier, nor do they get any of the proceeds. If the insurance Companies would pay legitimate claims timely none of this jockeying would be necessary. I had a hurricane claim the adjuster came out said it could be fixed for $1500. Great i say! Then the bad news I live in deed restricted community you cannot buy the color of roof tile I have HOA will not let you patch so I am getting a new roof. What's the dig deal here? Without Mr Cohen or others like him the Insurance industry would just continue to DENY DENY DENY until they hope you give up die or move. Shame on anyone who thinks Mr Cohen or others are doing anything wrong. SHAME SHAME SHAME You pay your premiums then have to go to court to make insurers pay. I say something is wrong here and it's not Mr Cohen it's the Insurance Companies and their lobbyists in our crooked politicains pockets SCREWING everyone! STOP! You have no clue what you are talking about. Look up AOB's & see how these unscrupulous folks are filing lawsuits, putting liens on homes, etc... Shame on YOU! Your a retard that doesn't have skill and understanding on how to pursue a claim the proper way. You drank Harvey Koolaid. Maybe he gave you a BJ, who knows!!!!!!! Turn to the page in your policy that covers matching. It doesn't exist. The policy does cover direct physical damage....hence the $1500. Turn the page to the Florida "Matching" Statute 626.9744. Claim settlement practices relating to property insurance.—Unless otherwise provided by the policy, when a homeowner’s insurance policy provides for the adjustment and settlement of first-party losses based on repair or replacement cost, the following requirements apply: (1) When a loss requires repair or replacement of an item or part, any physical damage incurred in making such repair or replacement which is covered and not otherwise excluded by the policy shall be included in the loss to the extent of any applicable limits. The insured may not be required to pay for betterment required by ordinance or code except for the applicable deductible, unless specifically excluded or limited by the policy. (2) When a loss requires replacement of items and the replaced items do not match in quality, color, or size, the insurer shall make reasonable repairs or replacement of items in adjoining areas. In determining the extent of the repairs or replacement of items in adjoining areas, the insurer may consider the cost of repairing or replacing the undamaged portions of the property, the degree of uniformity that can be achieved without such cost, the remaining useful life of the undamaged portion, and other relevant factors. (3) This section shall not be construed to make the insurer a warrantor of the repairs made pursuant to this section. (4) Nothing in this section shall be construed to authorize or preclude enforcement of policy provisions relating to settlement disputes. History.—s. 10, ch. 2004-370; s. 155, ch. 2004-390. Harvey is a crook. I literally heard him encouraging restoration contractors to over bill insurance carriers and send the file to him when they don't pay so he can file suit. Remember Harvey at Contents Only in WPB ? YOUR WORDS " I charge $1000 for every letter I write, send files to me" Thanks for the IICRC credits though, you will never see a file from me. On the other hand. First hand experience, working in claims adjusting, Insurance companies are not innocent themselves. They are crooked as hell, not wanting to pay covered losses or force homeowners to use contractors that do horrible work. Field adjusters are inexperienced, does not understand construction or literally stupid and wants to screw homeowners. Examiners are the same. No one is innocent in this industry. CAP MITIGATION as YOU DID MOLD. Most have capped mitigation at $3K or pre-authorization to exceed, which authorization is usually not given. Then the contractor pulls his equipment out early to move on to the next one and then the homeowner/policyholder ends up with mold infestation. And then the insurance company ends up paying $3K plus $10K for a total of $13K instead of maybe $5K for a proper water extraction and dry-out. $3K cap on EMS is not the answer. Getting rid of bad actor overbilling contractors and BETTER regulation and ACCOUNTABILITY of insurance companies claims handling practices to do the right thing and pay claims fairly would go a long way instead of all this arm swinging back and forth, always hurting the consumer public in the end!!! Take all bad actor fraudsters down, lock them up and throw away the key. There is no room for Fraud. Fraud is bad, whether by contractors, insurance companies, insurance company contracted adjusters, or policyholders and their representatives. Fraud is fraud, regardless of who is creating it and Fraud is not prejudice when it comes to bad actors causing it, or how it ends up affecting our premiums as a direct, or indirect result. Insurers can defend these suits and recover most of not all of their legal expenses if the win. It’s called a proposal for settlement. What jury would reward fraud? Yet these billion dollar companies with armies of lawyers choose not to fight. Why? Can it be that their “comparative estimates” come from construction companies wholly owned by the insurance companies themselves? Is that an independent estimate?Educate yourself before you make up your mind on changing the law. Go to sunbiz and compare peoples trust insurance with their “approved” contractor Rapid Response. Why is the same guy the head of both companies? These carriers are scamming you with these pretend journalists and their bought and paid for rhetoric. Look deeper folks. Read your policies. You’ll find the real villain if u want. In spite of these suits Florida insurers have higher profits and lower claim payments than the national average. How can that be if what this writer says is true? Think about it. Hard to figure where to start in your treasure trove of misinformation. You mention billion dollar companies (of which very very few provide Homeowners insurance coverage in Florida), then talk about People's Trust in the next sentence. People's Trust had premiums of about $165Mn in 2017 and assets of around $250Mn - a decent amount, but certainly not billions. If Florida insurers had "higher profits and lower claims payments" than the national average (over a reasonable timeframe - 10 / 20 / 30 years, due to inconsistency because of hurricanes - wouldn't all the large insurers who seek profitable ventures all be writing HO insurance in Florida? But they're not. As for an insurance company owning a contractor, that can provide an efficiency that can benefit the insured. The only folks making out from assignment of benefits are unscrupulous contractors and scumbag attorneys like Cohen. Florida homeowners get to pay higher rates to support these creeps. Finally you act like defending these frivolous lawsuits doesn't cost money. Of course it does, and they are filed in such quantity that it's logistically difficult to defend them all. So it was nice to read your defense of unscrupulous contractors and scumbag attorneys who cost Florida homeowners money to support their extravagant lifestyles. My guess is that you're one of them. ............or you have been completely snowed by them. What the AOB reform movement doesn’t tell you however is the cost that that Sen Broxson would inflict on Florida’s economy. Easily over 50,000 jobs lost in various industries including the insurance industry, adjuster’s , attorneys, clerical staff. Etc. How so? The claims will still need initial adjustment, and can be supplemented if need be. The attorneys are the problem. Until the loophole is closed, it will continue drive up HO premiums. This article, and some of the comments that have followed, are simply not based in reality. This is literally just a hit piece put out before Broxson's bill is voted on. The AOB is not a scam. It is a tool that has been law in Florida for over 100 years. All Harvey Cohen did was show contractors how to apply it. Before it's use in property damage claims, a contractor's only recourse for non payment by an insurance carrier was to put a lien on the insured's home. If Broxson's bill goes through, that is exactly what contractors will go back to...and guess what? The insured will have to hire Harvey or an attorney like him to sue the carrier anyway. If carriers want to reduce their litigation costs, they need to start paying valid claims. I would agree with most all you said Richard. Very good. However, it would behoove us to cut the cord on both ends at the same time, abuse is abuse and if both the entrance and the exit are not closed off, the fire feeds from either door!! Carriers paying fair amounts for valid claims and contractors not overbilling due to insurers cutting invoice amounts would be a good start all around. Other than that, anyone intentionally overbilling for profit, put them behind bars and loose the key. These fake roofers scammed my husband and 1 out of 4 rental property roofs and basically left us to pay tens of thousands of dollars when my husband has Stage 4 Cancer is undergoing Chemo and is disabled!! I have handled many suits in S. Florida and other parts in Florida, signed AOB is a scam as mentioned above. The contractor charges for services not performed or not covered by insurance, then file suit, the cost to defend is high, so a compromise is reached and the cost is passed on to the Florida Consumers through premium dollars. That is right, you AOB gets big money to the contractor and Attys. Next time you have a contractor ask you to sign an AOB, do not, it cost you in the long run and will start to limit water damage coverage to your home. Robert: Are you a lawyer in Florida? I've worked claims for 30+ years and have not seen one AOB contract that benefits the premium paying policy holder. I have owned and operated a restoration company for Over 30 yrs. I switched to AOB when the insurers decided to lowball everyone and only pay the fighters.Does anyone remember fair and reasonable? Well, we found a way to fight the lowball and not one single customer has been damaged in any way. Their homes were rebuilt , my company financed it , and I was always paid. They did not have to participate in the battle over pricing, what should be covered, and what it should cost. In my experience most claims were totally inadequate in scope and price. If you truly want to hurt the consumer leave them in the hands of these insurance companies and their vendors. Robert, the AOB is not a scammer, as you have mentioned, and "The contractor charges for services not performed or not covered by insurance, then file suit, the cost to defend is high, so a compromise is reached and the cost is passed on to the Florida Consumers through premium dollars" is simply nonsense. No one is getting paid for work they did not do, or work that is not covered. No one. We provide water mitigation peer review and consulting services, what have we seen coming from South Florida is beyond crazy . We received a file today for review, the water source was a faulty bathroom faucet, the leak was a water drop that owner was capturing with a bucket, owners hire a Public adjuster , PA brings his water mitigation company , they set 1 FAN and 1 DEHUMIDIFIER for 2 days and the water mitigation bill is over $6k. Charges for the fan are 5 times marker, dehumidifier 7 times market, they have over 16 hours for equip set up , take down and monitor, plus other 12 hours of labor and other fees, 380 sf of water extraction, and 2 hours for content manipulation, they drop the equipment 1st day and came back to pick it up 2 days later – no daily monitoring - (do the math, this 28 hours in a 2 days dry out , it means they apparently spent 14 hours in that house each day ) , there are no pictures, drying record nonexistent, they are billing for services not render (common denominator in al AOB files) but regardless of all , they are suing for full payment , it is beyond comprehension. We have seen bills for 30K for a home with a A/C leak impacting no more than 200 sf. We have files from storm Irma (Sept 10, 2017) with water mitigation in June of 2018. In contrast, the files we have received from places outside So. Florida or Tampa or other states show no more than 8% deviation from market. What makes S. Florida or Tampa different that other places? The proliferation of AOB water mitigation operators working in alignment with trial attorneys , loss consultants, plumbers and AC contractors. Please explain why an attorney can’t win a case like this for the insurer. Are you saying the courts won’t rule in your favor on a case like this? More blowing smoke to cover the real problem - lowball everyone and only pay those who are wise enough to hire an attorney like Mr. Cohen - who has done more for claimants than anyone in the state. You are naïve or an unscrupulous contractor or a scumbag attorney. AOB, as misappropriated by certain members of the Florida trial bar, is FRAUD. And it costs Florida homeowners in the form of higher premiums. Predators come in all shapes and sizes and in all fields of endeavor. It's always about the money, money, money ... and screw the consumers.